Pirate's gold is a math and logic puzzle, so consider this an early warning for those not into those kind of puzzles. The puzzle is based around dividing up gold in such a way that each pirate gets a maximum amount of gold, but more on the specific rules later. Five pirates of different ages have fought and plundered their way out of a sticky situation, and they've managed to take a chest full of gold with them on their ship. 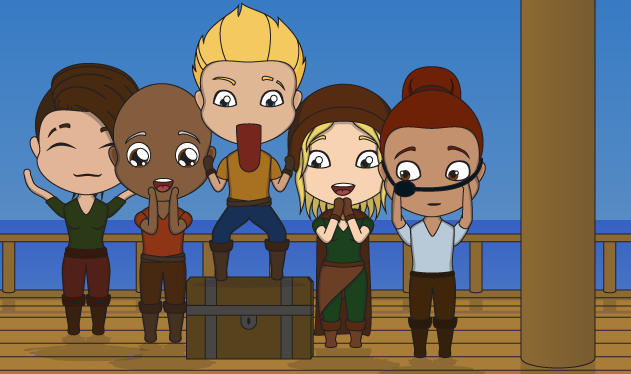 The chest contains 100 gold pieces, and while the pirates are incredibly happy with their loot at the moment, the gold will have to be divided among them. Of course, pirates have their own code, they don't just split the loot in 5 equal parts, that'd be way too sensible. Instead the eldest pirate will suggest a way to divide the gold, after which all the pirates vote, and if 50% or more of the votes are in favor of this division, the gold will be divided that way. However, pirates will be pirates, because if the proposal is voted against, the eldest will be thrown overboard. The next pirate in line then gets to make a new proposal, which will then be voted on. - Eldest pirate proposes how the gold is divided. - All pirates vote. 50% or more of the votes means the proposal passes. - If the proposal doesn't pass the vote, the pirate who proposed the plan will be thrown overboard. - All pirates are considered incredibly greedy, completely rational (I know, a bit of a contradiction), good at math, and do not wish to be thrown overboard. The question is: How will the gold be divided? Other questions might include: How much gold can the eldest pirate get away with? Will he be thrown overboard no matter what? How many, if any, pirates end up with nothing? Of course, these questions might be here to simply confuse you/your players, so try to focus on the rules to solve this, rather than the possible red herring questions. The answer is found below. The answer to the riddle is that the eldest pirate will end up with 98 coins, the second in line with 0, the third in line with 1, the fourth in line with 0, and the last in line with 1. So a 98 : 0 : 1 : 0 : 1 split. Confusing? Let's start by explaining why this works by starting with just two pirates, but let's also give all the pirates names to make things easier to follow. If there were only 2 pirates (Barbosa + Jack), the eldest could suggest a 100 : 0 split. They would then vote, the eldest would obviously vote yes, get 50% of the votes, and therefore the vote would pass. Now, if there were 3 pirates (Barbosa + Jack + Anne), the eldest would suggest a 99 : 0 : 1 split. Why? If they suggested a 100 : 0 : 0 split, the others would obviously vote no to throw them overboard. By giving Anne, the last pirate in line, 1 coin, the eldest pirate makes sure they get their vote. 1 coin is better than 0, and 0 would be all Anne would get if the Barbosa was thrown overboard, and only 2 pirates remained (see example with 2 pirates). So, if there were 4 pirates (Barbosa + Jack + Anne + Morgan), the deal would be 99 : 0 : 1 : 0. Jack would want to go for the deal with 3 pirates, as that gives Jack 99 coins, so he would vote no on Barbosa's proposal no matter what, so Barbosa obviously doesn't want to give Jack any coins. If Barbosa were to be thrown overboard, Anne would become the middle pirate in the 3 pirate deal, which means she'd get nothing, so by giving her 1 coin in the 4 pirate deal, you ensure you get her vote. 1 coin is still better than 0. Barbosa now has 50% of the votes, so Morgan doesn't need to be given a coin to win the vote. The same method applies to the 5 pirate problem. Some pirates want to ensure the 4 pirate deal happens, while others prefer to get 1 coin over 0, so they will agree to a 98 : 0 : 1 : 0 : 1 split to avoid the 4 pirate solution. In this case Emily and Anne will agree to getting 1 coin, as they would get nothing in the 4 pirate deal. That single coin is all Barbosa needs to give to buy their votes, and get a 60% majority.